The day started at 10 AM when the Yankees announced that they would be moving the start time back from 1:00 to 7:00 pm due to the terrible forecast in the afternoon. However, before the rains came, they got Judge out on the field for his second simulated game in as many days. Judge did everything asked of him, including hit a home run, which earned him a spot in the lineup for the 7 p.m. game - if it were at 1:00, he likely would not have been in there. In the game, Judge looked good in the box and hit the ball hard, but went 0-for-4 in his first action since he suffered his wrist injury on July 26. J.A. Happ got the start for the Yankees, and he had another great outing, as he allowed just 1 run (on a J.D. Martinez sacrifice fly in the third inning) on 4 hits and 3 walks, with 6 strikeouts. Happ, who did not get a decision, is now undefeated in his last 10 starts, in which he is 6-0 with a 2.34 ERA (57.2 innings pitched, 15 earned runs) over the stretch. Against the Red Sox, he has allowed two earned runs-or-fewer in each of his last 11 starts, going back to May 15, 2015, with a 4-1 record and a 1.62 ERA (66.2 IP, 12 ER) in the span. Happ is now one of just three pitchers since earned runs became a statistic in the American League in 1913 to allow 2ER-or-fewer in 11 straight starts against Boston, joining Bob Shawkey (14 games from 6/29/1921-4/15/1924) and Gaylord Perry (11 games from 9/9/72-9/11/74). Boston starter Nathan Eovaldi matched Happ, as he threw six shutout innings, allowing just 2 hits and 2 walks, with 5 strikeouts. He allowed just two baserunners to reach scoring position. This was Eovaldi's longest start since he threw eight innings of shutout ball against the Yankees on August 4. In this two starts against the Yankees while with the Red Sox, Eovaldi has thrown 14 shutout innings, allowing just 5 hits and 3 walks and a hit-by-pitch, with 9 strikeouts. With Eovaldi out of the game, the Yankees rallied against Boston relievers Brandon Workman and Ryan Brasier in the seventh. 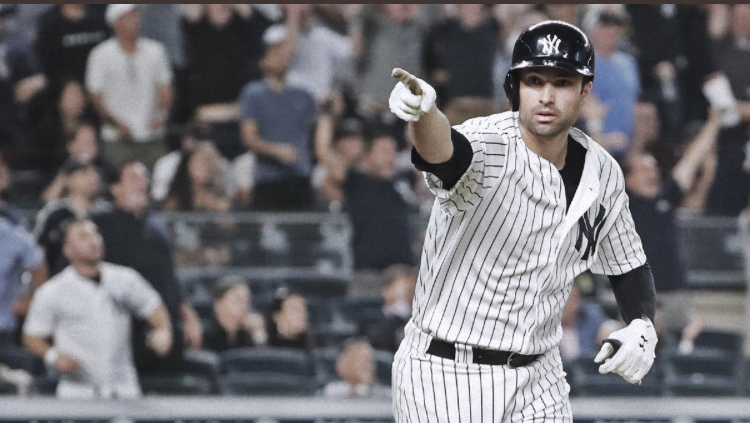 Aaron Hicks and Gary Sanchez earned walks against Workman, and with one out, they turned to Brasier for Neil Walker, who they wanted hitting from the left side. Walker blasted a home run to deep right, a three-run shot to give the Yankees a 3-1 lead. This is just the latest clutch homer for Walker, as each of his last four have given the Yankees the lead and his last three have come in the seventh inning or later. This was the Yankees' 18th go-ahead home run in the seventh inning or later. The only season in franchise history that they hit more was 2009, when they hit 21, per @ktsharp. Walker now has 10 home runs, which means the Yankees now have 11 players with double-digit home runs, tying the Major League record. The other four teams to do it are the 2017 Houston Astros, 2016 Minnesota Twins, 2015 Astros, and the 2004 Detroit Tigers. Zach Britton came in to close it out for the Yankees in the ninth, a long-overdue move since Dellin Betances has been disappointing in the role. Britton started out the night with a strikeout of Brandon Phillips before walking Brock Holt. Christian Vazquez hit what looked like a sure double play ball to third base, but Miguel Andujar threw it wide of second, and it went off Gleyber Torres' glove into center field, and Boston had runners at first and third with one out. This gave the Red Sox new life, as they hoped to make a comeback and clinch the American League East title. Sam Travis was up next for Boston, pinch-hitting for Jackie Bradley Jr., and he hit what looked like another possible double-play ball. It went back to Britton, who fielded it cleanly, and he threw it wide of second base, and that brought Holt in to make it 3-2 Yankees. Ian Kinsler was up next and he hit it back to Britton as well, but the third time was the charm for the Yankees, as they turned this one cleanly to close out the win and put off Boston's celebration for at least one night. The Yankees received a real reason to celebrate later in the night, as the Oakland Athletics lost at home to the Los Angeles Angels, 9-7. The Yankees (92-58) are now 2-1/2 games ahead of Oakland (90-61) for home field in the one-game wild-card playoff.